After a few decadent meals out, one too many birthday treats, and a Charleston-induced food coma, my body is revolting and refusing to eat anything besides veggies....after I eat pasta.....before I eat dessert....at lunchtime only. But hey, all that really matters is that I'm actually eating some veggies, right?! Joking aside, whether it's been all the rich food or the hints of spring in the air, I'm craving fresh produce like whoa. 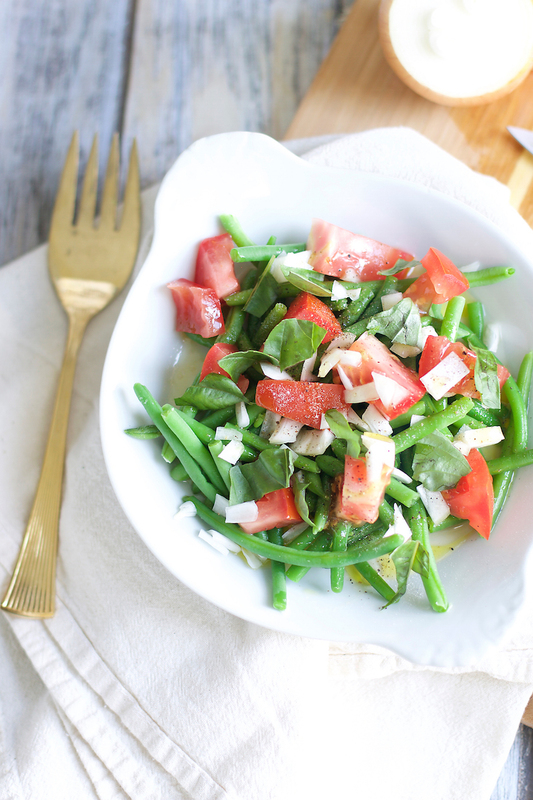 This easy green bean salad is one I've been making since I first started cooking. Ok, maybe a little later on, because when I first started cooking, it wasn't pretty (imagine all of the spices in your spice cabinet being combined in a bowl and then spooned out on a plate....yup, that would have been my idea of a "meal" way back at the tender ripe age of 5. YUM). But this recipe was from one of my first cookbooks. I don't remember the name of it, but I remember it went through the basic plants of a garden and explained, in kid-friendly terminology, how you could use each one. With only a few simple ingredients, this recipe has been a mainstay in my diet ever since. It's delicious as is, but if you want to be ba-na-nas, toss on a little goat cheese or feta (Mmmm! ), and for a quick meal, toss it with some pasta (Hello light summer dinner!). In a serving bowl, toss together the beans, tomatoes, and onion. Sprinkle with the herbs, salt, and pepper, and then drizzle with the dressing. 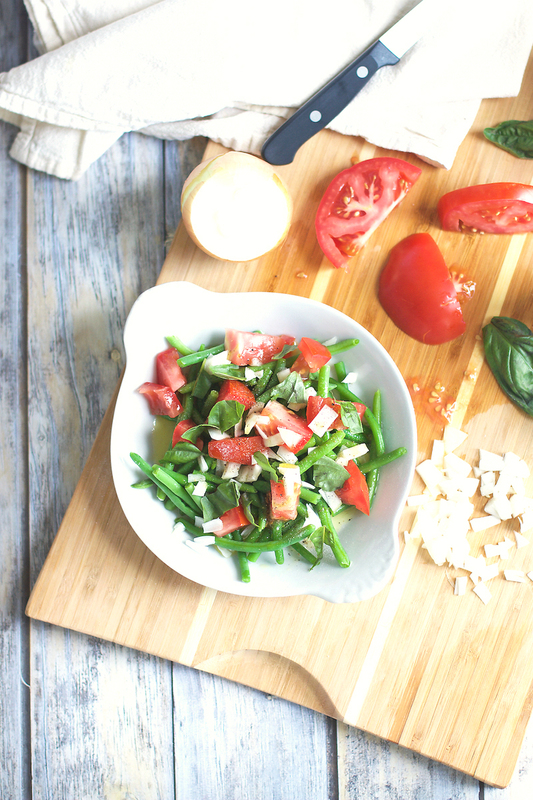 The salad can be served immediately, however, it tastes better after marinating in the fridge for at least 2 hours up to overnight. This recipe is vegan, gluten-free, and dairy-free. Leftovers can be stored in an airtight container in the fridge for up to 4 days (again, the longer it marinates, the better it tastes, although you might have a tough time keeping it around for more than a day!). The amounts of ingredients used are easily adaptable. Add more or less tomato, omit the fresh herbs, etc. Also, this can easily be doubled, tripled, etc. FYI, sometimes I double it and still eat the whole thing by myself, so the amount that it serves is adaptable too! For variations, you can add goat or feta cheese, cubes of crusty bread, some chopped cucumber, and, to make a quick meal, pasta.